Claudia Emerson joined the Virginia Commonwealth University Department of English in the summer of 2013. The following spring I was in her graduate poetry workshop, which she taught despite a reoccurrence of cancer. Near the end the semester, she sent an email inviting our class to continue meeting with her during the summer months of 2014. Several of you have indicated that you will be around this summer. I will for the most part—and think it could be fun to hold some poetry get-togethers, so let me know if you think this might be fun and helpful to your discipline. 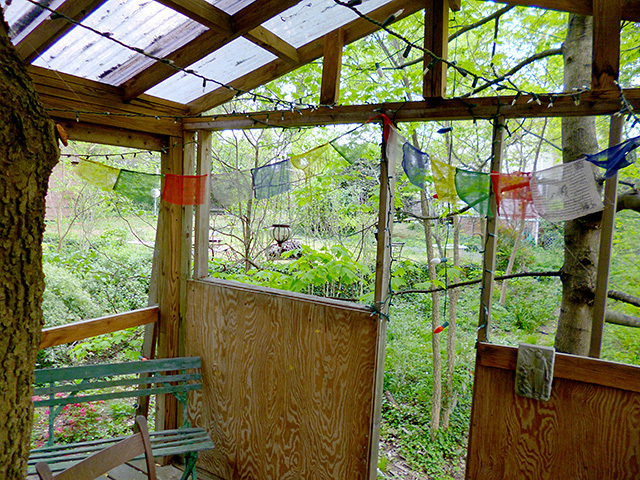 We met for these “treeshops” several times that summer, always gathering in her tree house in the back yard. (Claudia said we could move indoors when and if it got too hot to meet outside, but we never did.) 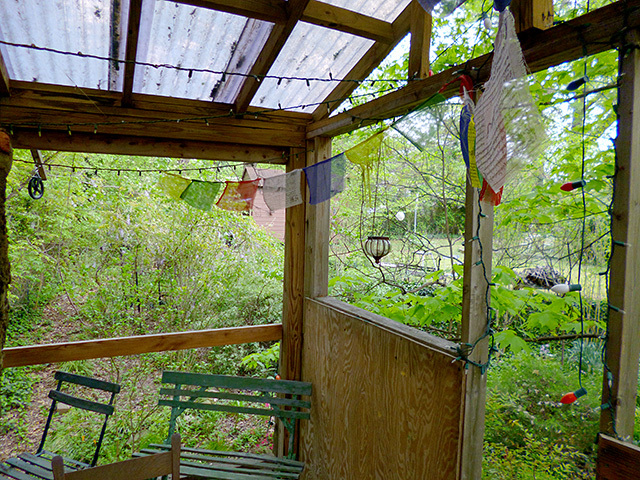 What follows are a series of photographs of the tree house, most of which were taken by me a little less than two years later, except where otherwise noted. 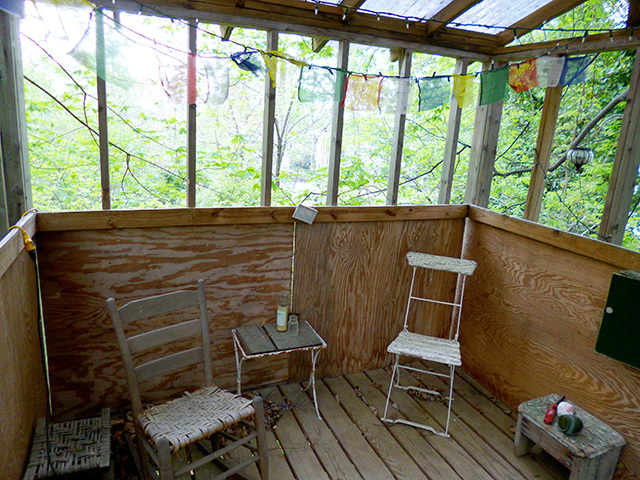 It’s strange to see the tree house empty now, because I can so clearly picture a rotating cast of my classmates and a few additional poet friends gathered in a circle there, swatting at mosquitoes and passing around printed copies of our poems, while Claudia sits next to a basket of snacks and steers the conversation, asking questions, offering advice. Pictured here is a vacated space, barely visible within the landscape it inhabits, and yet under Claudia’s vision it became—however briefly—something extraordinary. A wooden sign that Claudia Emerson and her husband, Kent Ippolito, made. 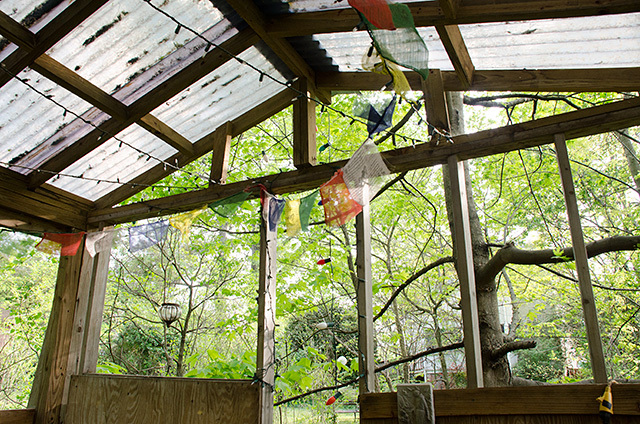 It hung inside the tree house, beside the door, a banner over our heads throughout our treeshops. 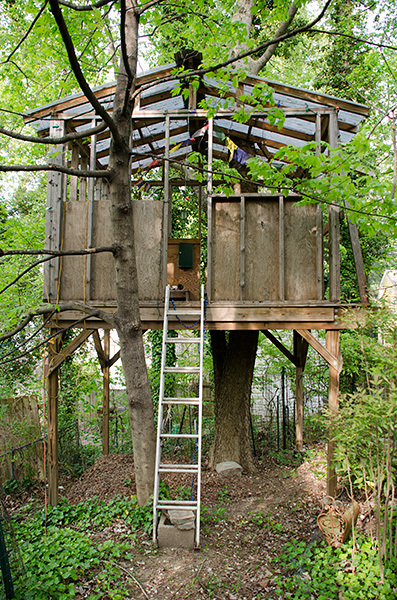 A view of the tree house from the back yard. Another view from the back yard. 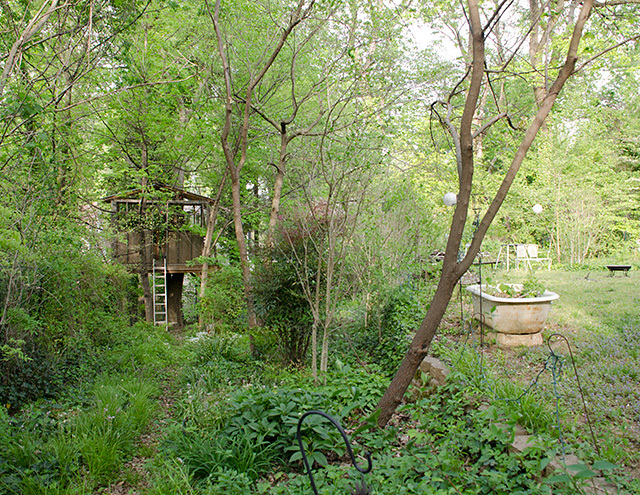 A closer view of the tree house, taken on the path leading from the back porch of the house. 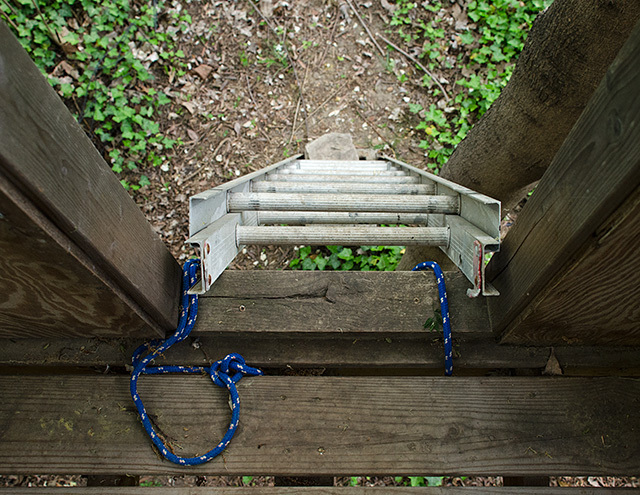 The ladder we used to climb up into the tree house, the only way to get in or out. 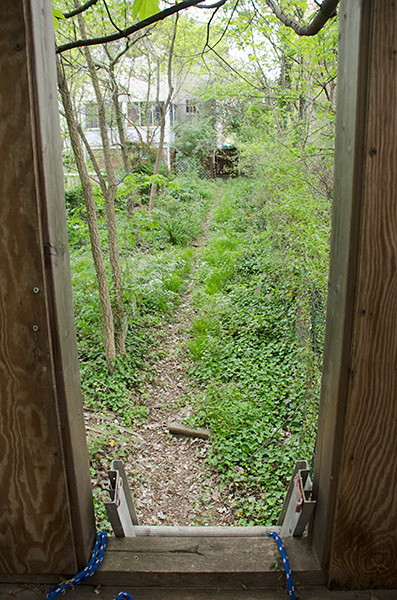 A view from the threshold of the tree house, looking back at the path and the rear of Claudia and Ken’s house. 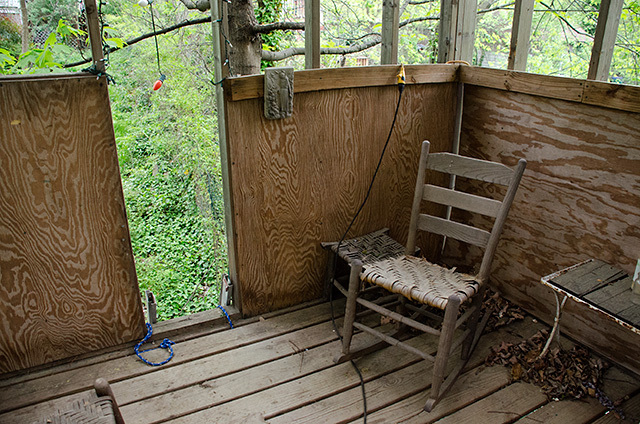 Interior of the tree house, to the left of the doorway (as you enter). 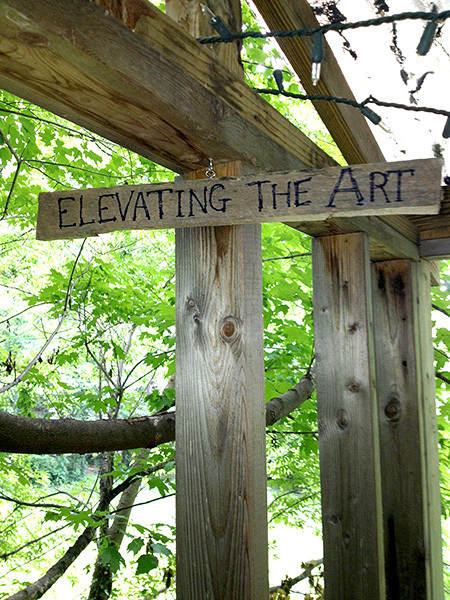 The “Elevate the Art” sign hung on the left side of the doorway (though it has since been taken down, and is not pictured here). 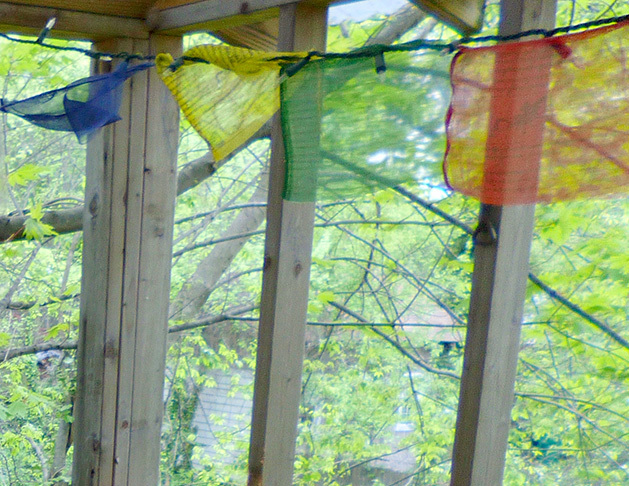 Prayer flags over the rocker pictured above. A view looking up at the corner to the left of the doorway (as you enter), with the small image of a human figure and a view of the ceiling. 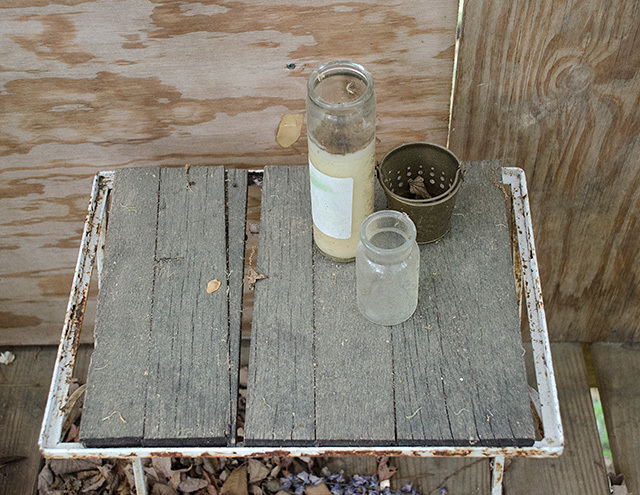 A close-up of a small table with candles. 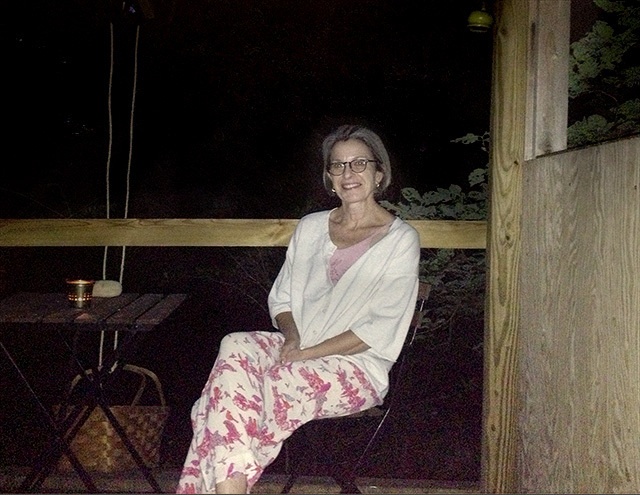 When Claudia lit these candles during our tree-shops, they did little to deter the mosquitoes. 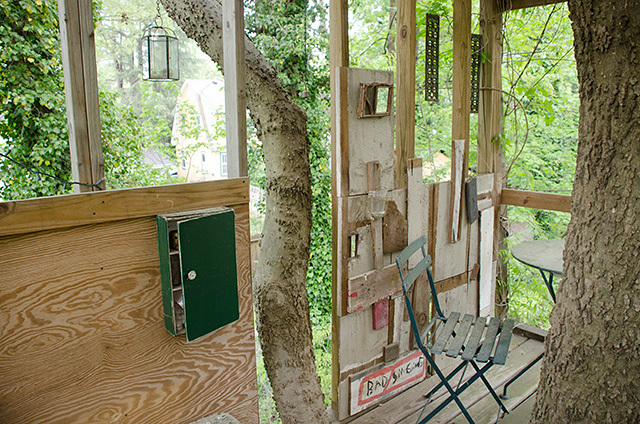 Interior view of the rear wall of the tree house, decorated with various objects. 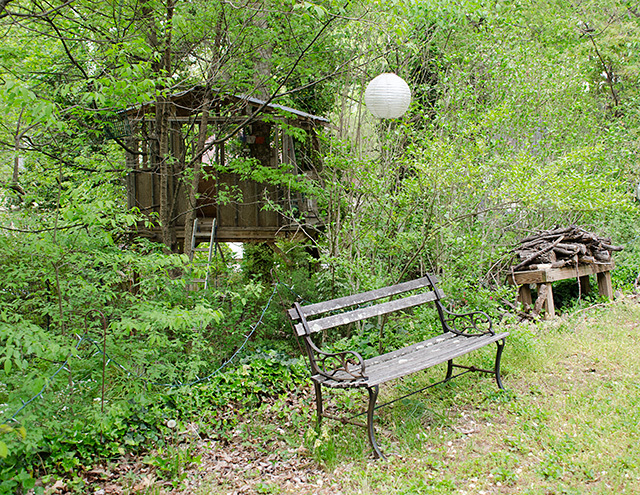 (When you entered the tree house, most of the objects pictured on the right would be hidden behind the trunk of the tree.) In the small green cabinet, Claudia stored extra candles and matches. 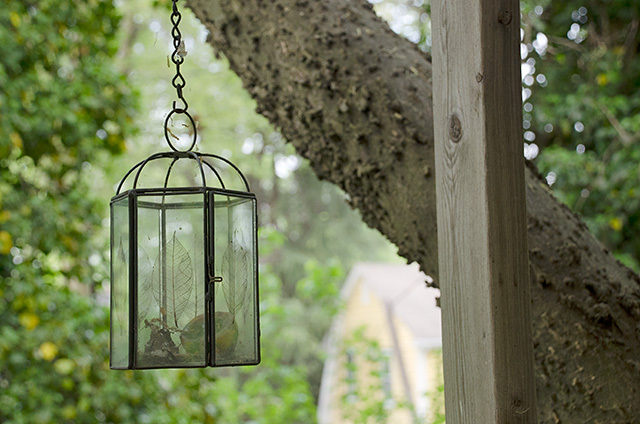 A candle holder suspended in an opening of the rear wall. 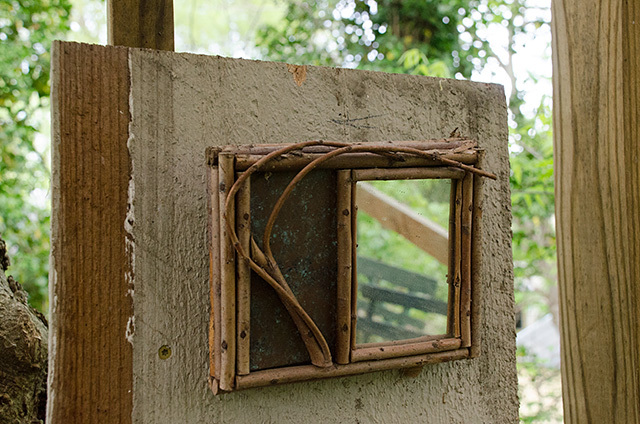 A mirror, hanging on the rear wall. 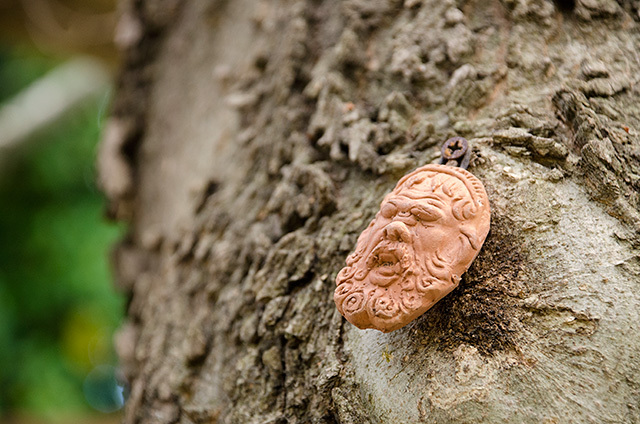 An object that Claudia had attached to the trunk of the tree, on the side facing the doorway. Interior view, facing southeast (on the right, as you enter). The pulley pictured upper left had been fitted with a rope (since broken) that was attached to a small basket, which we used to raise and lower snacks (white wine, bottled water, chips, and salsa) in and out of the tree house. Interior view of the southern corner, to the right of the doorway (as you enter). During our workshops, students typically sat here. A view of the southwest wall (with the doorway), showing part of the roof. 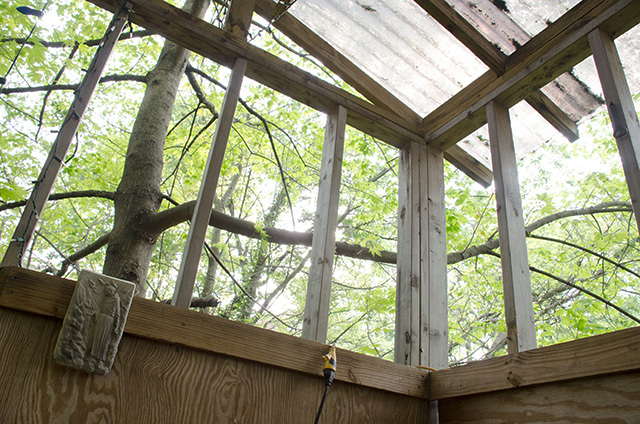 A photo by Kent Ippolito of Claudia Emerson in the tree house.